Vancouver, British Columbia--(Newsfile Corp. - October 30, 2018) - Thunderstruck Resources Ltd. (TSXV: AWE) (The "Company" or "Thunderstruck") is pleased to announce that ongoing geochemical sampling on the Liwa Creek gold prospect has expanded known targets and discovered a significant new gold zone. The combined 2017 and 2018 prospecting and geochemical sampling programs at Liwa Creek have resulted in the discovery of multiple gold showings over a three-km, northeast-trending structural corridor that is open in all directions. The Company's intensive exploration approach combining initial stream BLEG sampling, followed by ridge-and-spur soil sampling, and anomaly-focused prospecting has, and continues, to lead to new discoveries. In particular, sampling programs have returned high-grade gold and silver assays over previously discovered zones and expanded those zones. In addition, a potentially significant new zone, featuring the highest-grade soil sample yet collected, has been discovered. Brien Lundin, Thunderstruck's Chairman stated, "Following up on the successful results from our Rama prospect, field work continues to expand our Liwa prospect as well. In combination with our Nakoro and Wainaleka VMS discoveries, it's becoming obvious that our Fiji properties offer tremendous potential. We are excited about continuing to advance on all fronts." As detailed in the Appendix, prospecting and geochemical sampling programs at Liwa Creek have resulted in the discovery of multiple gold showings over a three-km, northeast-trending structural corridor that is open in all directions. Two distinct styles of gold mineralization have been identified at Liwa Creek: narrow northeast-trending high-grade gold plus base metal veins lacking significant wall rock alteration typified by the Jensen's Showing; and dominantly north-south trending wide zones of gold-silver mineralized quartz-sericite-illite-pyrite altered volcanic rocks such as those occurring at the Liwa Ridge Showing and possibly the newly discovered Lower Vatuvatulevu gold target. The two styles of mineralization exhibit characteristics of sub-epithermal gold-base metal and intermediate sulphidation epithermal gold-silver veins, respectively. The classification is significant in that both deposit styles are interpreted to have close copper porphyry deposit association, with intermediate sulphidation veins being interpreted as shallow-level counterparts of deeper gold plus base metal sub-epithermal veins located alongside porphyry copper deposits. Juxtaposition of relatively shallow high-level intermediate sulphidation gold-silver vein system and deeper sub-epithermal high grade gold veins is interpreted to indicate overprinting of early deep copper porphyry related high grade gold veins by relatively late high-level gold-silver mineralization. The Company believes this indicates the presence of a significant and long-lived hydrothermal system at Liwa Creek. Lawrence Roulston, Thunderstruck Director, noted, "The methodical exploration program at Liwa continues to be very effective at outlining this extensive gold system under soil cover. On-going work continues to push out the limits in prospective areas. Liwa already has a footprint in line with major gold-bearing systems. The size and the gold tenor of this system are extremely encouraging, especially in this Pacific Ring of Fire setting that hosts multiple world-class gold deposits." Thunderstruck is advancing toward securing joint venture partners on its VMS and porphyry targets as it focuses on this highly prospective gold zone. 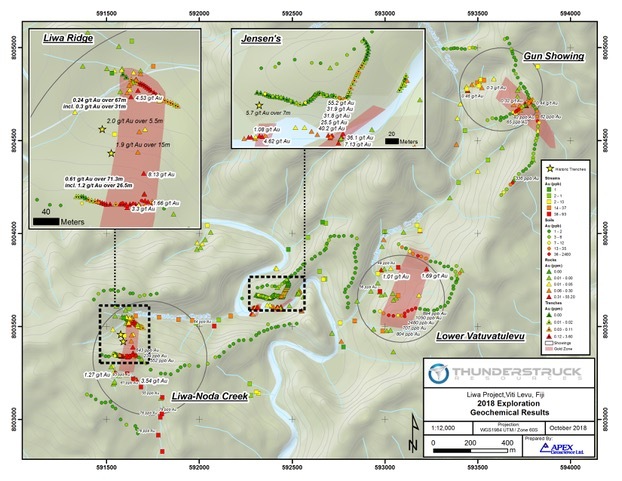 Thunderstruck Resources is a Canadian mineral exploration company that has assembled extensive and highly prospective properties in Fiji on which recent and previous exploration has confirmed VMS, copper and precious metals mineralization. Liwa Creek is one of four projects, each of which is being marketed as potential joint venture opportunities. The Company provides investors with exposure to a diverse portfolio of exploration stage projects with potential for zinc, copper, gold and silver in a politically safe and stable jurisdiction. Thunderstruck trades on the Toronto Venture Exchange (TSX-V) under the symbol "AWE" and United States OTCQB under the symbol "THURF". Kristopher J. Raffle, P.Geo. (BC) Principal and Consultant of APEX Geoscience Ltd. of Edmonton, AB, is a qualified person for the project as defined by National Instrument NI 43-101. Mr. Raffle has reviewed and approved the portion of the technical content of this news release as it relates to the Liwa Creek Prospect. During 2018 all stream sediment samples were submitted to Australian Laboratory Services Pty. Ltd (ALS) labs Perth for BLEG determination of gold. Auger soil samples were submitted for gold and multi-element geochemical analysis via a 25 gram (g) sample split subject ICP-MS. Prospecting and trench rock samples submitted for 30g gold Fire-Assay analysis and multi-element geochemistry by four-acid ICP-ES. Given the reconnaissance nature of the samples, Thunderstruck has relied on the external QA/QC of ALS which included the insertion of insertion of standard, blank and duplicate samples at a rate of 10% into the sample stream to confirm the accuracy of the reported results. At Liwa Creek exploration was designed to follow-up and expand on broad trenched gold zones at the Liwa Ridge Showing (0.61 g/t gold over 71.3 metres; including 1.2 g/t gold over 26.5. metres); further develop the high-grade Jensen's Showing (previous outcrop quartz vein rock grab samples returning 36 and 32 g/t gold from outcrop); and locate the source of widespread gold in float rock located within confined drainages of the Lower Vatuvatulevu Creek and Gun showing areas (see the Company's February 13, 2018 news release). Of the 55 current rock grab samples collected at Liwa, a total of 15 samples returned greater than 1 g/t gold or 10 g/t silver; and up to 55.2 g/t gold and 379 g/t silver (Table 1). At the Jensen's Showing two parallel, northeast trending, high-grade gold bearing quartz veins are exposed in the bed of Wainamoli Creek over a distance of 50 metres. The veins dip 60 to 80 degrees to the northwest and occur along the upper and lower contacts of an approximately 10 metre thick intrusive dyke cutting volcaniclastic rocks of the Wainimala Group. Rock grab and small diameter backpack core drilling of the northern vein resulted in four (4) samples returning gold assays of 55.2 , 40.2 , 31.9, and 25.5 g/t gold (the later cored over a 0.22-metre true-width of the vein) with associated lead, copper and zinc values. Jensen's Showing quartz veins are brecciated and contain massive to semi-massive galena, chalcopyrite and sphalerite with vuggy comb to crustiform banded quartz vein textures in association with sericite-illite host rock alteration. The Jensen's south vein ranges in width from 0.1 to 0.5 metres in width and exhibits similar polyphase brecciated, anastomosing pinch-and-swell, comb and crustiform banded textures, with a total of 6 rock outcrop samples returning between 1.45 to 7.13 g/t gold. A distance of 100 metres to the east of the main Jensen's discovery outcrops a rock grab sample of silicified and comb textured quartz veined Wainimala Group volcanic breccia rocks returned 4.62 g/t gold. Rock outcrop and subcrop float grab sampling within Liwa Creek at the northern extent of the Liwa Ridge Showing, 800 metres west of Jensen's, returned 4.53 g/t gold and 379 g/t silver (the highest silver assay to date at Liwa Creek), respectively, from silica-flooded and quartz stockwork veined intrusive. A total of 141 additional ridge-and-spur aguer soil geochemical samples were collected Liwa Creek. Sampling was designed to isolate potential source zones to the northeast of the Jenson's gold zone, and widespread gold in float rock recovered within the Lower Vatuvatulevu Creek and Gun showing areas. Auger soil sampling within the Lower Vatuvatulevu Creek area resulted in the discovery of a significant new gold zone. Prior stream BLEG and prospecting float rock grab sampling within this small 400 x 400 metre drainage returned anomalous gold values. Current soil sampling along the southern ridge resulted in 8 soils collected over a 160-metre interval returning greater than 20 ppb gold, and up to 2,480 ppb gold (2.48 g/t gold) in soil. The result is four times greater than any previous soil sample collected on the project (643 ppb gold from the Liwa Ridge Gold Zone 1.5 km to the west). The five highest soils samples returned 707, 804, 894, 1050 and 2,480 ppb gold. The orientation of this newly discovered gold zone is presently not known. An aggressive follow-up via intensive prospecting, hand trenching and expansion of ridge-and-spur aguer soils to the south is warranted. In addition, soil sampling along the Gun Showing ridge returned isolated anomalous gold values including 336 ppb and 82 ppb gold, which warrant additional follow-up sampling and prospecting. Hand excavated trenching at three locations (GT1, GT2, and GT3) totaling 29 metres within the Gun Showing area was designed to follow up on previously reported anomalous gold in soil values of 65 and 82 ppb gold (see the Company's February 13, 2018 news release). Trenches were excavated to a depth of 1 metre into the subsoil, however competent outcrop was not reached in any of the trenches. Trench GT3 returned 0.2 g/t gold over 2 metres from 0 to 2 metres; and 0.17 g/t gold over 3 metres between 8 and 11 metres. Trench GT2 returned 0.12 g/t gold over 2 metres; in addition to silicified and veined float rock grab samples recovered during excavation that returned 0.44, 0.20, and 0.15 g/t gold; including 4.5, 6.2 and 9.6 g/t silver, respectively. Trench GT1 did not return significant values. Completion of stream BLEG geochemical sampling in the Noda Creek drainage designed to evaluate the potential southern extension of the north-south trending Liwa Ridge Gold Zone. Of the 23 Noda Creek stream BLEG samples collected a total of 13 samples returned greater than 20 parts-per-billion (ppb) gold and are considered anomalous. A stream BLEG collected from the Noda Creek headwaters at the southernmost known extent of the Liwa Ridge gold zone returned 93 ppb gold. This sample represents the highest gold in stream sediment value returned form the Project to date, and underscores the potential to expand the Liwa Zone southward.